It took a village before to muster livestock, but not anymore. Thanks to these modern day cowboys, it only takes a helicopter and some next level chasing skills. With vast cattle stations across the Australian Outback, where each station can be thousands of square kilometers, there's no doubt that the mustering of livestock is one of the most difficult jobs there is. Imagine your herd spread across the length and breadth of Wales and the challenges of normal cattle farming methods comes into stark relief. Mustering targets the rounding up of herds of beef cattle, sheep, horses, camels, buffalo. These animals that roam the station will be gathered once a year for routine livestock health checks, branding, live export and shearing. It is conducted through various methods by the use of horses, vehicles such as utes (Aussie slang for utility vehicles), motorcycles, ATVs (all-terrain-vehicles) and helicopters. The mustering season occurs during the dry season in Australia, between the months of March and November. Aerial mustering started in the early 1990's and has been consistently growing since then. 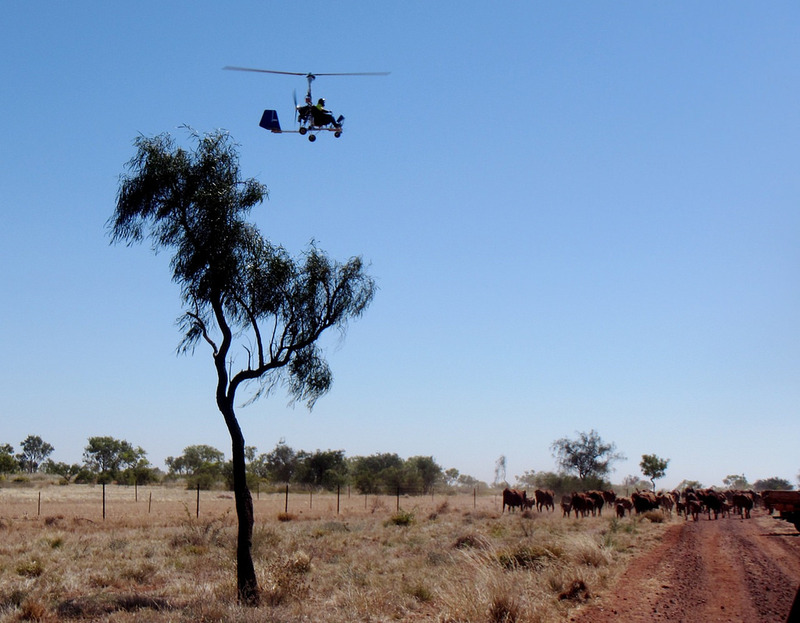 Mustering from the sky helps reduce the cost in time and money spent in herding the stock. The Robinson R22 is often the chopper of choice for these skilled aviators. The mustering pilot will take to the skies in a R22 to locate the roaming cattle and then notify the ground team of its location via CB Radio. Although it's one of the fastest method to round up livestock, aerial mustering is no different from the ground based mustering process. Just like the other methods, it involves long, hard hours, patience and skills - added with an increased risk of danger. Keeping your cool while flying as low as 5ft AGL at a maintaining speed while keeping na eye on the herd is not an easy job. An aerial musterer is not just a skilled aviator. A lot of factors are considered in to qualify for the job; it takes both passion in aviation and agriculture, especially in handling livestock, working well in a team and excellent communication skills and quick thinking. According to industry experts, it's much easier to teach a cattleman/cattle-woman to fly than it is to teach a pilot who has no experience with cattle, which makes it the primary reason why it requires an extensive amount of training. Sure, flying is a challenge but mustering stock is something that you learn in years and there's no room for errors. Nina Hardie, a Helicopter Muster Pilot from Western Australia says, "You're not only flying the machine (often at low level), but you're also constantly thinking about where are the other pilots that you're flying with, how the muster is going in terms of daylight left and distance, where the fuel is, communicating with the ground crew on where horses/motorbikes are, how the cattle are travelling and basically trying to be 10 steps ahead of everything." Before getting the job of a muster pilot, an extra 15 hours of low flying is needed in addition to the 110 hours for a standard license. Under Australian Civil Aviation Safety Authority (CASA) guidelines, they need to have a mustering endorsement by getting a minimum of 10 hours training with an approved mustering instructor. After that, they still have a long way to go. They need to work for another 1-2 years with a contract mustering team and will undergo a series of practices with the supervision of a senior pilot prior to commencing a single chopper mustering activity. Safety is the utmost priority in this line of work, not just for the pilot but as well as the cattle. There's more to aerial mustering than just chasing these cattle in helicopters. A good knowledge of animal welfare and stock handling is significant to the operations, which is why there are now stock handling schools in Australia to educate farm owners, stockmen and especially pilots in working with the animals. 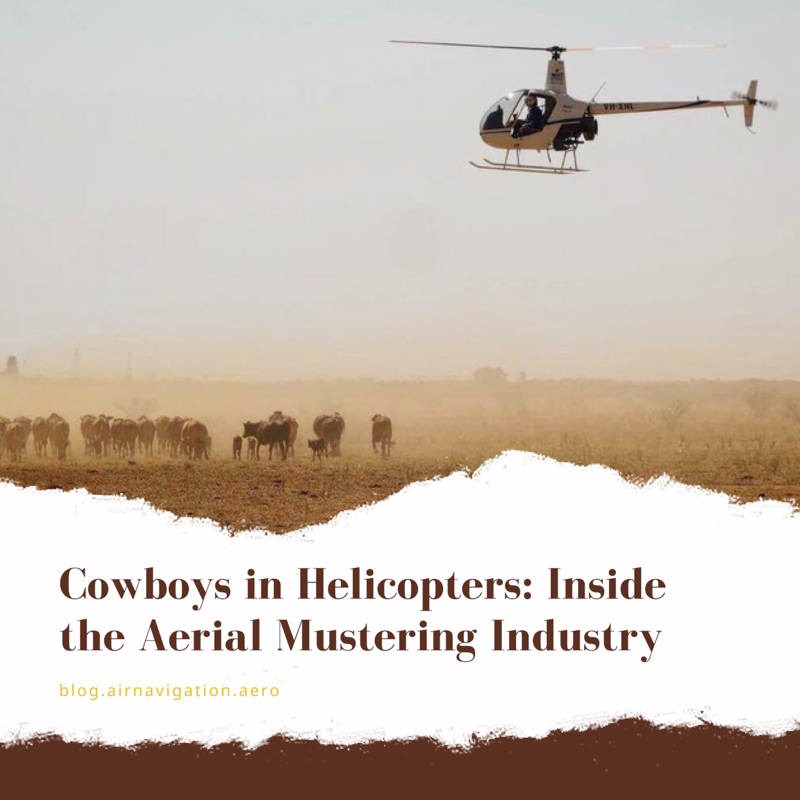 As the aerial mustering industry continues to grow, the demand for mustering pilots has also increased, especially with the contribution it has brought to the beef production sustainability. As of the moment there are more than 500 but not less than 1000 mustering pilots in Australia. Although it may sound a cool profession, it's not as cool as people think it is, considering all the work that needs to be done. And it's definitely not cool in the dry, hot, dusty Australian outback. Mustering season takes month and even almost a year especially in the larger stations. Months of hard work being away from families, long days spent in camps and nights spend in swags on the ground. There's no such things as weekends or holidays. Every day is a busy day for the men and women, their horses and machines. If you want to know more about the helicopter mustering industry, this website has everything you need. Or, check out Craig Gifford's channel on YouTube for awesome heli-mustering videos. Are you a pilot with cool travel stories that you want to share? Send us a message on our social media accounts Facebook , Instragram or send us an e-mail at charlyne@airnavigation.aero .